A day (or two) of indulgent pampering is a fabulous way to start or end an energetic hen weekend. A spa visit can make a hen do all the more memorable, offering the bride and her guests some relaxation and pampering ahead of the Big Day. At SpaSeekers.com, you’ll find a wide range of spa days, and overnight spa-resort breaks for hen groups. Keep reading to discover what guests can expect from each of the experiences we offer. We went to Hallmark Hotel Manchester for a hen weekend and were not disappointed! The facilities were amazing and the Jacuzzi was fabulous. We were able to relax and have a laugh with the staff members who were friendly and really helped to make the bride’s weekend special! . What can guests expect from a hen party spa day, night, or weekend? A single spa day usually provides two indulgent treatments per guest - a prescription facial and a back, neck and shoulder massage. Free access to onsite facilities (usually a swimming pool, sauna and gym) and a light lunch is included. These pamper days are ideal for ladies looking to be pampered as part of a hen weekend in the bride’s favourite city. Please click here to learn more, and to purchase group pamper day gift vouchers. These vouchers can be exchanged at many of the 500+ venues we represent nationwide, making them ideal if you’re currently unsure when - and where - you’ll be celebrating. 12 of us enjoyed a group spa day as part of my hen weekend and I would highly recommend Nidd Hall Hotel, Harrogate . The staff were welcoming and friendly, the facilities were excellent, the food was lovely and the two treatments we had were fantastic. I definitely want to go again! These are similar to the group pamper days, but usually include three rejuvenating spa treatments instead of two. As well as free onsite facility access and a delicious meal, additional extras like glasses of bubbly, complimentary robe and slipper use and discounts for additional treatments are also included, to make the bride and her guests feel extra special. Inclusions vary between venues and packages – always check before you book. As these spa days are designed with the soon-to-be-bride in mind guests can expect a celebratory - yet tranquil - atmosphere. Let the bride and her guests get the very most from their spa treatments and the leisure facilities with a night - or two - in a deluxe spa-hotel resort. As well as pampering treatments, free bubbly and sports/health facility access, breakfast in bed, a decadent three course evening meal, a girly DVD, and exclusive spa and onsite shop discounts are often included within these packages. Always check individual package listings to confirm inclusions before booking. 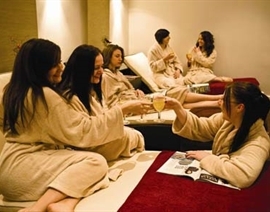 You can browse all our hen party spa options here. You can also use the spa finder on our homepage to explore all packages from resorts in your preferred location. For even more, take a look at our article on organising a hen party. Tip: Always check availability and book early to avoid disappointment. Need help? Call us on 024 7671 6192 today and we’ll tell you all you need to know. Our monetary gift vouchers can be used as full or partial payment towards any spa day or break found on SpaSeekers.com. They are ideal if you want to let the bride choose her own hen spa experience. Our vouchers start from £25. Need a last-minute gift? No problem – you can print your voucher after purchase. To learn more, please visit our dedicated spa vouchers page. Have any questions about our group deals, or gift vouchers? Call the friendly SpaSeekers team on 024 7671 6192 today for help.